Face of the Day: Am I Mulan Yet? You know me: I can’t resist a good deal. So when Walgreen’s put their Disney-inspired e.l.f. makeup kits on clearance, I had to get one. Which one did I choose? 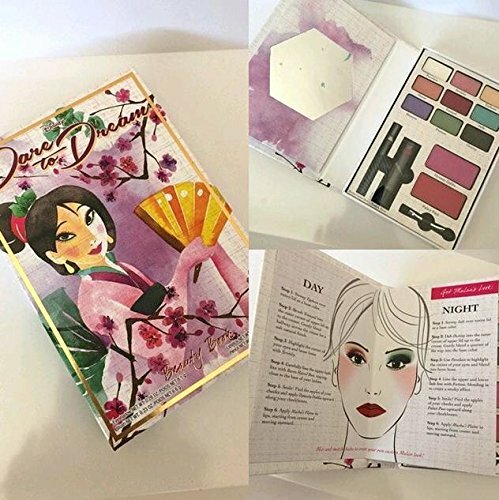 I was most drawn to the eye shadow colors in the Mulan Disney Dare to Dream Beauty Book. It comes with eye shadow, blush, eyeliner and lipstick. One cool thing is that they give examples of day and night makeup with diagrams and instructions. Today, I’m rocking the Mulan Day look! Do I look like Mulan? Do I look like I’m about to decide to be a dude in order to restore honor to my family? I just followed along with the instructions in the palette. This includes using the pink Dynasty Dahlia blush on my cheeks. Look at those lips! This is definitely my favorite thing from today’s look, which is saying a lot since I’m generally not a lipstick person. This is the lipstick from the Mulan Dare to Dream palette (which was awesome by the way), but with a darker lipstick around the edges for some dimension. In that case, I used NYX Simply Vamp Lip Cream in Bewitching. In the instructions for the Day look, they have you using several shades, including my favorite from the Mulan Dare to Dream palette: Tranquil. That’s the maroon shade used in the crease. So pretty. I also used the eyeliner that comes with the palette and my Essence Lash Mania Reloaded Mascara. I can totally see why they call this a day look. It’s soft and pretty. What do think? Am I Mulan yet? Let’s chat about this FOTD in the comments!